Amazonia is a pretty color, but it doesn’t feel all that unique. It just feels like Dior finally caught up with the Chanel Khakis, and with all the greenish Essies that have come out over the last couple of years. 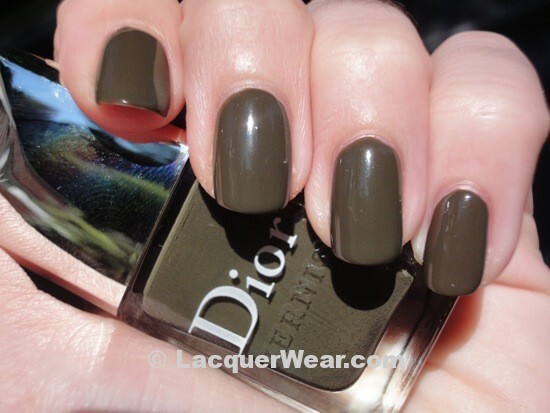 But Dior’s formula and brush are so great that I like it best out of my khaki polishes. It only took two coats to be opaque and dried quickly with a nice gloss. It’s really mostly brownish, but there is a definite green tone. I reviewed OPI’s The Living Daylights here, over Tomorrow Never Dies from the same Skyfall Collection. After trying that combination, I thought that Amazonia might make a nice base for The Living Daylights, with the green in Amazonia echoing the teal green glitter. I like this combination ok, although it’s not quite what I was hoping for. I like that all of the glitter colors do contrast with Amazonia enough to show up, but Amazonia is not as green as I was remembering, and it doesn’t coordinate with the teal glitter like I was hoping. I like the mattified version better – for the picture below I added a coat of Essie’s Matte About You. Amazonia looks lighter and more shimmery with the matte topcoat, and the glitter pieces are more distinct. I think it helps the teal pieces look more teal, too. All of the topcoat layers seem to have caused some shrinkage problems with Amazonia, though. You can see some shrinkage at my nail tips, and my thumbnail ended up with a huge gap from my cuticle, looking wonky. I used Essie’s Good to Go along with the Essie Matte About You, so I’m wondering if the Essie topcoats don’t get along with the Dior formula very well? 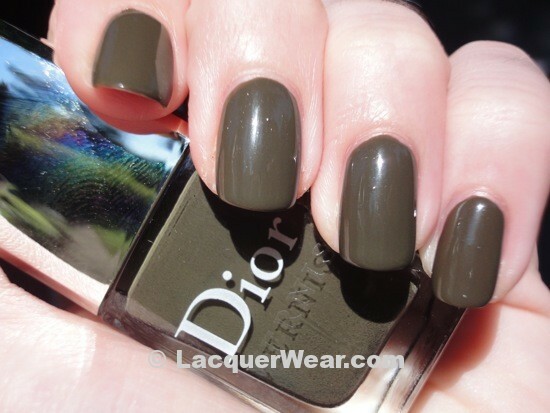 I usually use Dior topcoat with my Dior polishes, so I haven’t run across this problem before. Dior’s Amazonia is available at department stores and Sephora now.